An explosion of two performative installations simultaneously critiquing power and elitism found in the contemporary (art) world. Made up of two groups of multidisciplinary artists, this exhibition explores power dynamics through performative research, institutional intervention, and an overload of sensory experiences. Eastern Washington artists and educators, Peter Christenson and Phillip Mudd, collaborate on their project "Juried Performance,” an ongoing inquiry into the symbols, processes, and systems associated with institutionalized power and the hegemonic elite. Revolving primarily around a collection of recorded parasuicidal rituals that occurred in front of an absentee jury, the project analogizes the “juried art competition” to today’s sociopolitical climate. Videos of these performances were then mailed to nine well-known contemporary art institutions, essentially forcing review of the uncommissioned performances. The artists will perform during Pioneer Square’s artwalk. 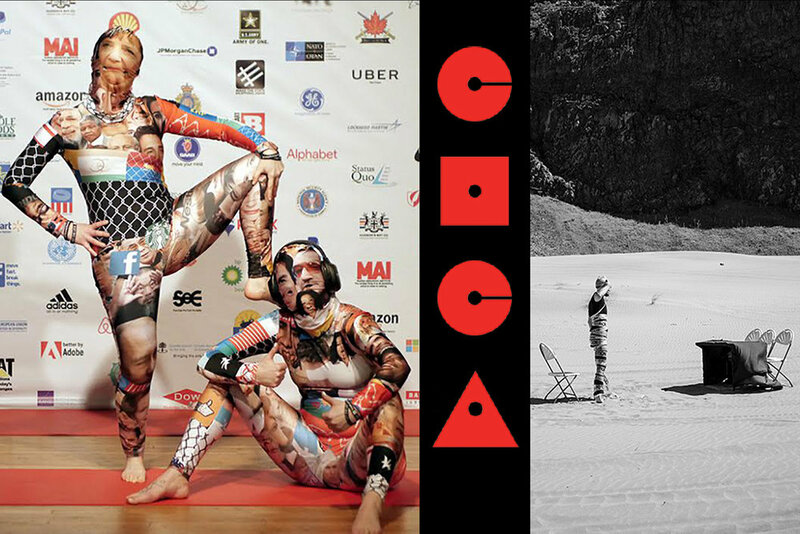 Also in the exhibition is Desearch Repartment, an anonymous art team from Canada, the US and Germany that questions cultural and economic power through their creation of a conceptualized world in which the prison industrialized complex and performative art collide. The group appropriates the hyper capitalist world using an ever expanding universe of social practice, text-based manifestations, fake products, marketing gimmicks, famous people’s faces and more. Inhabiting the Desearch world translates into the practice of their “exercise program,” YAGA; navigating and becoming a part of an online group, “State of Exceptional (SOE) Webnation;” and integrates these in a performance experiment with costumes, movement, narration, projections and the SOE online activities and digital imagery. They aim to critically examine the relationship between embodiment and identification within digital capitalism. Opening reception on Thursday, September 7, 6pm – 9pm, as part of Pioneer Square ArtWalk. Exhibition opens September 7 and runs through September 30.